Despite its pub atmosphere, Atkins Park Tavern serves chef-worthy fare with regional accents. 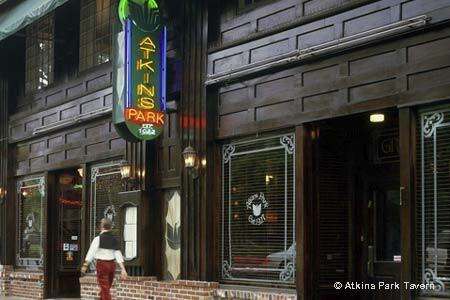 : Open as a deli in 1922, Atkins Park occupies a site that has been in continuous operation as a tavern ever since. The second story was originally the house that stood here and was elevated in 1922 when the deli was built out below. Local culinary traditions include a snack of boiled peanuts enhanced with sea salt. Good fried green tomatoes come with a house-made pimento cheese spread. Deviled eggs bear the touch of house-made bacon. Pan-roasted trout is sweet and flavorful, and the whipped mashed potatoes on which it rests are almost worthy of their own plate. Fried chicken is paired with cream gravy, classical yet not often seen anymore. Vegetarians will be pleased with a seasonal vegetable plate that dips into local products for its contents. Desserts are hard to pick from, but a salted caramel cheesecake on a crunchy pretzel crust or roasted apple bread pudding would do the trick, and portions are plenty for two. If you missed the shrimp and grits at dinner, you can order it for brunch. The wine list is decent if not spectacular, and certainly has better choices than many pubs offer, but the brew list has worthy alternatives.